As if he wasn’t already busy enough booking travel for his ever-expanding client base, MTA – Mobile Travel Agents Member Ben Deering has taken on extra-curricular activities with a bit of a difference as caretaker of the iconic Centenary Tower in Mount Gambier. Opened in 1904, the Centenary Tower has always been a source of great pride for Mount Gambier residents and in the past, a popular tourist attraction for the South Australian town. 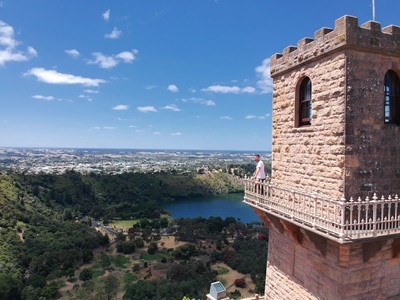 Located 190 metres above sea level, views from the tower offer 360-degree views over Mount Gambier and the region’s volcanic Blue Lake and on a clear day, all the way to Port MacDonnell some 35 kilometres away. Unfortunately, the tower had been closed in recent years due to the local council struggling to find a suitable caretaker – then along came Ben. Ben, whose wife Tanya is Mount Gambier born and bred, had always been curious about the tower and its history and when he heard the council was looking to find a caretaker, he put his hand up for the job, was given the key to the tower and will manage the caretaker role for the next six months on a trial basis. Thanks to Ben the Centenary Tower will now reopen three times a week and once every weekend – weather permitting – with the Mount Gambier flag to be proudly flown on open days. Attached image – MTA – Mobile Travel Agents Member, Ben Deering atop the Mount Gambier Centenary Tower.